Though it is officially fall, it doesn't feel like it yet, but there are signs. This cottonwood leaf floated by on the lake this morning. Before I took all of your advice last year, not to pull up plants I couldn't identify, I plucked all of these umbrella like plants in the patio bed, certain they were weeds. Well, look what they turned out to be. Every shade of flower from fuchsia to coral and pink. I have no clue what they are, but will remember them next year. One last clematis blossom for the year. Okay, my distaste for large blossomed flowers has been swayed. I now like the cannas and the other ones are growing on me. I'm still trying to smile at the hibiscus. These have popped up all around this last week of summer. Spider lilies or fairy lilies perhaps? A nice surprise nonetheless. Mrs. Mantis, in prayer and laden with eggs, will lay them soon; I wish she could over-winter under bark, but I guess that is the way things happen. We have had the city house for nearly a year now - have seen the gardens throughout the year. Though the garden has peaked, it has been a good year of growing. I planted potato vines that cascaded over the eight foot drop from the patio to the bottom yard. The chartreuse was spectacular. I learned that some of the coleus I planted grew too tall for this bed as it shaded out other plants and somewhat obscured the lake view. I really had nowhere to plant new things and will fit in some small bulbs and seed the beds in the spring. All in all, it was a good year in the garden. I am not looking forward to that first freeze and will miss all the color, but will try to find interesting things in the winter garden. We've had an abundance of praying mantis and walking stick critters this year, I wonder why ? Looking forward to cooler weather, and the changing seasons ! Yes Jo, cooler weather. I'm not getting out the throws yet and am still in shorts and flip flops. Every year is a wonder. Used to be able to count on the weather, etc. No praying mantis here..how neat theyr are to look at.I have seen walking sticks in Fl.. I love thos potato vines..here too..the chartreuse is stunning..they take a while to take off here but once they do..watch out.. I love chartreuse w/ purples. I have never seen that small white clematis..cutie she is. Monique, they do have a shape like a snapdragon, but they are a perennial and flower from the stalk. The stalks are full of water, like impatiens. I thought I pulled them all up last year, but evidently they overcame it. Is an inukshuk a cairn? I love a packed flower garden. I think you have a foxglove there. Digitalis. My knowledge is the lesser of all people here; we'll see what it turns out to be. I look forward to seeing the early snowdrops and crocus which come quite soon after Christmas in a mild Winter. Yes, Pat, I need to buy some bulbs soon. I've never seen a snowdrop and wonder if they'll grow here. I love seeing those early bulbs too. What a breathtaking garden. You've done good!!!!!! Thank you Sandra, but most of it was already here when I bought the place, so I can't take much credit for it, but it was one of the deciding factors to buy it. That and the view. Loving your garden. So much. Thank you. Thank you Child. I hope to make it even more beautiful next year. Donna, it's been an absolute pleasure to see all the seasonal views from your City House garden. The month by month discoveries must have reassured you about your choice of this particular new home. That is what I'm looking forward to Frances. I still need to take pictures of all the beds and place spikes where there is room to plant something. Yes, it was and I spend a lot of time on my back porch. Will bundle up this winter and sit back there too. 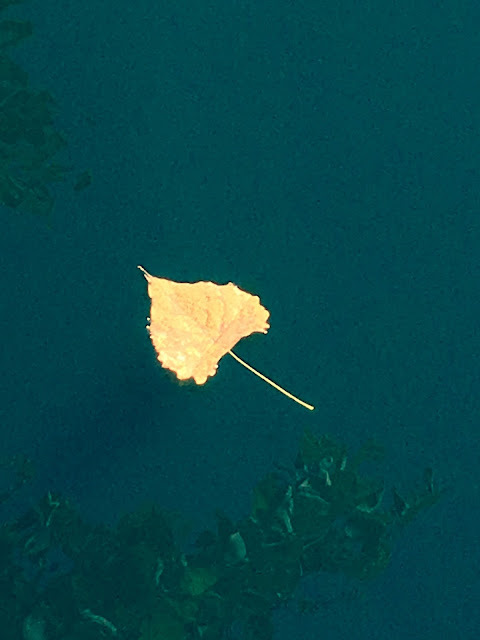 I was just at another blog that took the same picture of the yellow leaf floating on water. love those pink things. if you ever find out what they are called I'd be interested. and we cll those red lilies surprise lilies because they come up and bloom so quickly without foliage that one day nothing and the next a flower. surprise! I love those too and the other ones I showed. I have never seen them and to come up in September this far north is nice. PS - was it the exact same picture Ellen? I just wondered because I am still trying to watermark (my two experts took four hours to try and get it for me and I still haven't been back to their lesson because my head exploded). I don't know how to do anymore to tell folks not to re-use my pictures and artwork, not that the leaf picture was anything I care about. But, I do care about some of it. Your garden and that VIEW! Gorgeous, Donna. Thank you Val. They are creepy looking and fly, but eat the bad bugs in the garden and are the gardener's friends. I've read you can order their cocoons. I have also seen them after hatching and they are the tiniest little bugs. Your garden is beautiful Donna and so much colour and interest. Thank you so Jacqueline. I always think of your grand entrance and how beautiful it is. Not cool here and in fact we've had hot temps later than usual, but better for me as it gives me longer to enjoy the garden. I'm not looking forward to the cleanup; the leaves are quite an effort to remove. I might try and find someone to do it for me this year. I love hibiscus. They are so exotic and delicate looking. Enjoy your time at the farm. I love hibiscus in my Bigelow Red Raspberry tea I drink everyday, but the plants, not so much. I love roses and peonies, so I guess it is the large tropical flowered plants I have to get used to. Sigh. Bird of Paradise - my nightmare plant. Lovely pictures of your gorgeous garden Donna - the lady who lived there before you must have been a gardener - so many lovely plants. Thank you Elaine. She mass planted and the succession of flowering plantings was a joy to behold. I just need to find a spot here and there to put some bulbs in and will seed in the spring. I'm also going to mark the spots where I could plant something. Donna darlin'!!!!!!!! Good morning dear. Well, this in between space after summer and right before fall is a tricky transition. It's still warm here, but trees are starting to turn....but not quite yet. With school back in full swing, my days are now turned toward academics, homecoming, grading and tired evenings! But the weekends, oh, those are mine. It's raining right now, and all I need is a copy of that magazine with our home on the cover AND inside...but do ya think we can find a copy here? NOT! Thank you so much for coming to visit! Oh that's funny Anita. Surely they will mail you a complimentary copy. I'll find mine at Barnes and Noble this week. Beautiful images, Donna. We have candy pink lilies here that sprout only in early August, right around my daughter's birthday, so I call them Elena lilies! I love that Amanda. It is strange to have flowers first bloom this late in the year. Nice surprise. Thank you. You've been busy because I haven't seen you post in a long time. Hello from Alberta, Canada ... Just discovered your blog via Dutchess ... lovely ... will be back in order to explore some more ... thank you for sharing ... smiles ... Love, cat. Hello Canada. I have a fellow blogger I love in Quebec, La Table de Nana. Do come back and I'll visit there. Great shot of Mrs. Mantis. Though not a beauty and creepy head follows you around, she is a friend in the garden. Glad you stopped by Dutchess. It is always a pleasure to read your blog. Love all the flowers, but I have a soft spot for clematis. Fall is meant to be showing up here, but we've been having temps in the 80s lately. This past weekend saw the beach packed out with folk trying to soak up the last of the rays. Oh the lasts of summer are wonderful. We just had our first cold front and it was heaven. I'll be wishing for these warm days in a couple of months. A colourful post, Donna, summer's glorious last shout! I like the first and last shots. We are enjoying gentle, misty days, sometimes with the finest mist of rain that makes you want to lift your face up to the sky. It's a lovely time of year. Here too Rosemary, but a little too hot still. There is always a period of what to wear and when here. A couple of more weeks should do it, though on my way to the city today, I didn't see any of the trees turning. I'm repeating myself but I just love your garden.